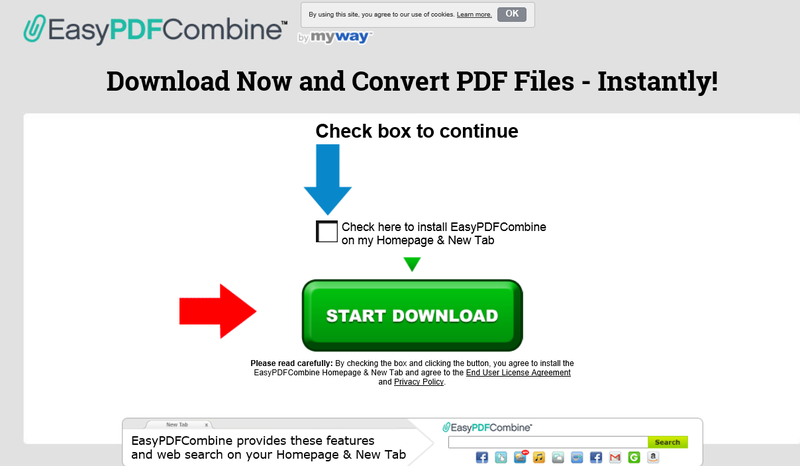 What is Easy PDF Combine? Easy PDF Combine is an application that should allow users to combine PDF files, convert different file formats to PDF, translate text, use dictionary with one click, and access popular pages quicker. This information is taken from its official website, so it is not surprising that in reality Easy PDF Combine is not as beneficial as it is advertised on its official page. Once users install Easy PDF Combine on their computers, they, first of all, notice a new page set on all their browsers. This page contains at the top a bar with buttons opening third-party pages which allow users to convert files, translate texts, share files with friends and family easily, and combine PDF files. In other words, it does not do anything very beneficial itself. All it does is provide users with buttons leading to those third-party websites. They can be accessed without the help of this application, so there is no point in keeping it. Specialists suggest going to remove Easy PDF Combine from the computer also because they have found that its presence might be related to some security-related problems. What does Easy PDF Combine do? Why do I have Easy PDF Combine installed on my PC? Users who find Easy PDF Combine installed on their PCs have downloaded it willingly from its official website, or it has entered their computers without permission together with free software. Users allow undesirable programs to enter their computers when they download and install free software from untrustworthy web pages very often. This might be the case with Easy PDF Combine too if you have recently installed a new application. How can I uninstall Easy PDF Combine? Luckily, Easy PDF Combine is not an extremely harmful program, so it is possible to delete Easy PDF Combine manually. You need to go to remove its extension from browsers. The Easy PDF Combine removal can be implemented automatically too. In this case, users need to install a good malware remover and then let it delete Easy PDF Combine automatically.